The air-cooled water chiller units and air-cooled heat pump units are the ideal solution for small, medium size and big living and commercial contexts . Projected with refrigerant type R410A with a cooling capacity range from 20 kW up to 400 kW. These units are equipped with axial fans for outdoor installations, Scroll compressors with high performance and low electrical absorption and plate heat exchangers. They are usually connected to water terminal units like fan coil type for small applications and for the air conditioning in wider environments or for industrial applications. The high reliability of the units and of the components installed inside allow an easy and fast maintenance. We can offer a wide range of accessories which can be factory installed or separately supplied. On demand it is possible to have different kind of unit configurations and versions. Cooling mode only available ( mod. 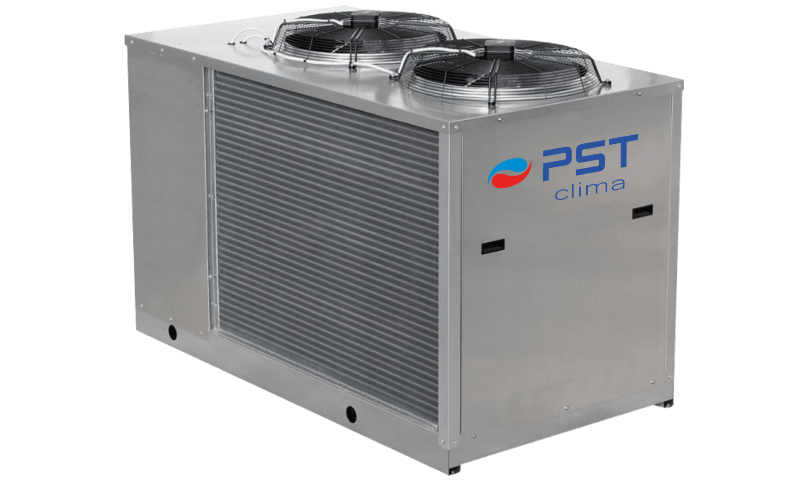 PS-ACW/C) or heat pump reversible version (mod. PS-ACW/H) and Inverter version with DC Scroll compressors. Efficiency class A+.